The search for the transcendental light of dawn and dusk. I am enchanted by the light. Living in Oregon's Willamette Valley I find myself hungry for the big sky east of the mountains. My landscapes are a product of being deeply rooted in a Hood River orchard where I grew up. Working among the apples allowed me to watch the light move over the landscape and to truly appreciate subtle color changes. I attempt to hold all that is beautiful close to my heart. Shooting photographs at first and last light of the day reveals the essence of the feeling or the place. I use a method of applying very diluted washes over totally dry paper to build deep, rich colors that would get muddy if mixed on the palette. The washes don't take long but with the drying time one can get only 5 or 6 washes a day. If drying is accelerated you risk getting watermarks where you don't want them. Dark areas may take as many as 30 layers. Usually I have more than one painting going at one time so I can be working on one, while others are drying. The paper must be soaked, edge-glued to the board, then press dried so that the painting can't ripple when washes are applied. I have traveled in Europe and most recently the south of France where I painted for a month. I was so intimidated by the beauty and history of Monet's Garden that I could only paint it's irrigation ditch. (see Monet's Ditch)It's really true about the magic light of the Mediterranean. I facilitate murals with students, as an artist in residence using varied materials from recycled paint to concrete and stone. My background as an Art teacher enables me to combine art principals and subject goals to make learning fun. The longest mural is 640 feet long in a middle school main hallway. The project was conceived by the 6th grade Science teacher to educate the students about the importance of the urban watershed. It took 2 years and over 800 students were involved. Currently I have returned to my first artistic love, sculpture. Once again it is light I crave. 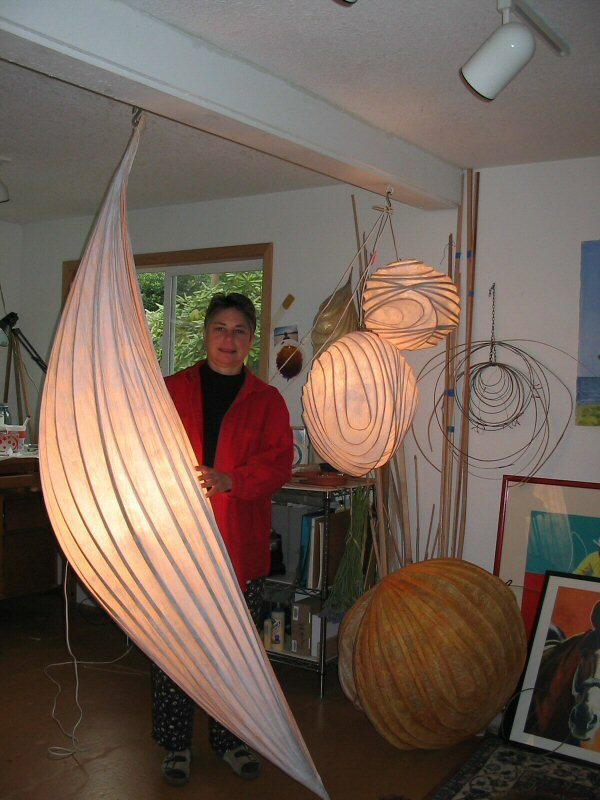 The lamps I create are sculptures with a purpose. They are made of wood strips cut thin on the table saw, bent into shape and held with hoops and clothespins,as each strip is glued in place. It takes a long time because glue joints must dry before more are added. when the shape is complete, the skin of small pieces of tissue paper are painted on with diluted white glue. About 10 layers with attendant drying time make a surprisingly tough translucent skin.